These small metal buckets come in a variety of beautiful metallic colors, making them the perfect centerpiece for a vintage-themed wedding. Use the optional plastic liner to turn them into vases, tap small holes in the base and create decorative garden planters, or add rice, sand, or another filler to hold fake flowers, lollipops, and other decorations. For detailed instructions on planting in galvanized steel, click here. Can't get enough of rustic metal pails? 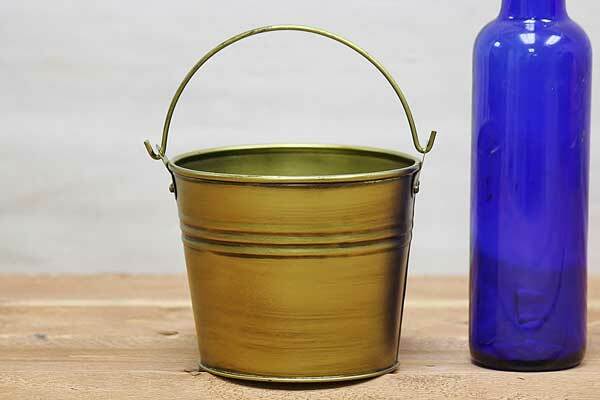 See our full line of vintage metal wedding buckets here and our favorite copper pails here. You might also like these small metal buckets in 12 colorful styles.